In the second of the five editorials reflecting on the relationship between polio and routine immunisation moving forward we are presenting Polio-Free India: The Role of the Social Mobilization Network (SMNet) by Chris Morry and Kier Olsen DeVries. Following from the previous editorial this looks at social mobilisation in India and the importance of the Social Mobilisation Network in UP and Bihar. Chris and Kier are the only CI employees who will feature in these editorials and like the other authors come at the issue with their own extensive experience of polio, routine immunisation and the communication action that supports both. We very much welcome your critique of these perspectives as a contribution to both the final steps for polio eradication and expanded routine immunization coverage. There are two options for you to read, review and comment. 1. The full editorial follows. Please review and then comment in the block provided. 2. Click this link to the Polio Communication site, review the editorial, and where you see Join the Discussion at the end of Roma's contribution, please log in using your Facebook or Twitter accounts, and comment. Thanks for engaging. Your critical review will help to move these issues forward. Eradicating polio in India was an enormous endeavour. From the mid-1990's onward, despite hindering factors such as poor health services and infrastructure, a large population with high birthrates, and low rates of routine immunisation (RI), India immunised 175 million children under 5 years of age twice a year by mobilising 2.5 million vaccinators in national polio eradication campaigns. An additional 45 million children in the highest risk areas were vaccinated more frequently during sub-national immunisation days (SNIDs). Even with such a huge effort, it took more than 20 years for India to eradicate polio and 24 years before it received polio-free certification from the Regional Certification Committee for Polio Eradication in South East Asia. There were many factors that made this possible, and a great deal more work and vigilance will be required to keep India polio free, especially while polio circulates in nearby countries. Below, we explore the critical role played by social mobilisation and communication in India's polio eradication programme and its continued importance in sustaining that achievement. India's polio eradication programme began in 1990 when it signed the Declaration of the World Summit for Children and committed itself to eradicating polio by 2000. The initial strategy was to conduct National Immunisation Days twice a year during which volunteers worked with the health system in hundreds of thousands of booths set up across the country. Communication action focused on recruiting and supporting this huge force of volunteers and mobilising parents to bring their children to the booths for vaccination. This strategy improved immunisation levels significantly, targeting children under three at first and then expanding to children under five. It was possible because public support for eradicating polio at the time was so widespread it became a major and very popular social movement drawing enough volunteers from all walks of life to operate the over 700,000 vaccination booths across the country. However, while it was a tremendously successful health initiative and an extraordinary example of social mobilisation that succeeded in significantly reducing the number of polio infections, it was not enough to eradicate the disease and a new strategy of house to house vaccination was adopted. 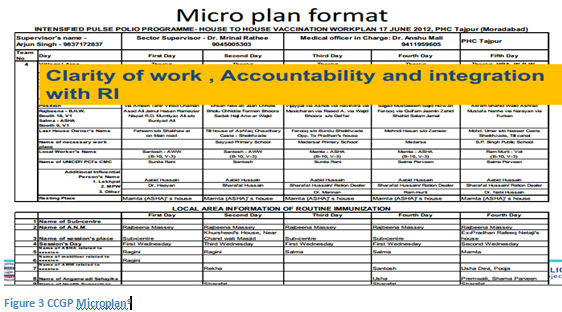 This new strategy led to the need to shift from a programme focused on mass volunteer mobilisation to one employing large numbers of trained vaccinators going from door to door. However, while the house to house strategy increased coverage even further, it still missed too many children. Vaccination teams were not always aware of mobile communities and sometimes fell short of going the extra mile to cover those in hard-to-reach places; in other areas, parents did not always make their children available for vaccination. In cases where children were not available the reasons were varied from simply being out of the house or traveling to parents refusing to allow them to be immunised. Among those who refused the reasons also varied. Some were holding out in the hope their resistance would give them leverage in struggles for other development services, some worried about their children being vaccinated too many times and others had heard rumours about the vaccine being targeted at specific communities to cause impotence. These operational, political and social elements led to pockets of the population that were un or under-immunised and that continued to carry and spread the virus. 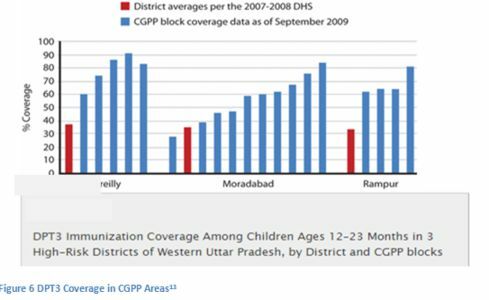 Further analysis demonstrated that lower rates of OPV coverage were clustered in certain areas and amongst underserved groups such as Muslims, members of lower castes, mobile/migrant populations, those working in industries such as brick kilns, and slum dwellers living in conditions of extremely poor sanitation, limited access to clean water, and poor nutrition. Many of these areas were to be found in Uttar Pradesh (UP) and Bihar and in the final years before eradication, West Bengal. It was in these areas that a new and much more intense form of social mobilisation was initiated and India's polio social mobilisation network was established. Starting in 2003 and in response to increasing numbers of parents refusing to immunise their children because of suspicions and rumours related to the vaccine, UNICEF and the CORE Group Polio Project (CGPP) met with the government of UP and the Social Mobilisation Network (SMNet) was established. 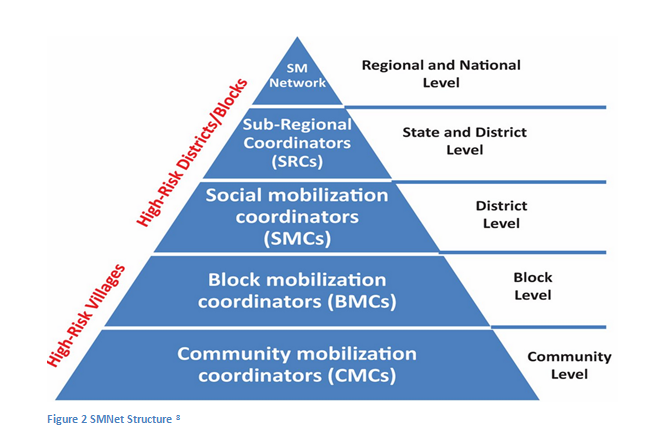 This process took time to build, but, eventually, worked at a significant scale in UP, Bihar and to a lesser extent, West Bengal so that by 2012 there were "roughly 9,125 community mobilizers: some 5,529 frontline workers in Uttar Pradesh, 1,596 in Bihar and around 2,000 in West Bengal". Below is a map showing the extent of the network in UP alone as of 2012. "SMNet in UP SMNet's close support for the provision of OPV to children in these hard-to-reach and refusal households required much more localised planning and communication and a deeper and more nuanced understanding of what was happening within communities. It required engagement with these underserved populations in ways they understood and through people they trusted. It required building partnerships through dialogue and community-led action. India's SMNet grew out of these requirements. The scale of the overall polio campaign meant that large numbers of local community members were already involved in the programme as vaccinators and monitors. The SMNet brought in a new cadre of community members who worked as mobilisers and influencers in close collaboration with existing community health workers responsible for delivering health education and services, such as Angawadi workers (health workers chosen from the community and given 4 months training in health, nutrition, and childcare), Accredited Social Health Workers (ASHAs) and traditional birth attendants (TBAs). The SMNet focused on identifying missed children during and between polio campaigns, strengthening the tracking of newborns; encouraging parents to immunise their children across all recommended antigens; and educating mothers on a range of issues that improved child health (exclusive breastfeeding, sanitation, nutrition, the use of oral rehydration therapy (ORT) and zinc to tackle diarrhoea, etc.) in addition to immunisation. The programme also worked closely with local community leaders and influencers, who assisted the mobilisation staff in identifying and meeting with families of any caste, religious group, or mobile population to encourage them to immunise their children. For instance, community mobilisation coordinators (CMCs) organised mothers' and influencers' meetings, using educational materials and discussions to promote immunisation and other positive health-seeking behaviours. It was a large structure but one that had a very strong base in the communities it worked in. A hallmark of this community base was SMNet's ability to understand and respond to community needs. For instance, right from the beginning it was clear that many communities were questioning why so much attention was paid to polio vaccination when many other, and to them more urgent, health needs were being neglected. During the first two years of SMNet, CGPP launched health camps and sanitation drives to address concerns. This kind of responsive innovation was a continuing element of SMNet which grew over time as the programme became better at collecting and interpreting data flowing from the campaigns and its own mobilisation network. SMNet developed new tools for collecting programme data in these areas. These tools tracked which households were immunising their children and which were not, the reasons for children being missed, how many children were in each household, and a range of other social information such as who each household trusted for information and guidance on health. This allowed them to develop detailed 'microplans' that were used to focus activities on a community by community basis. Over time, these have been integrated with routine immunisation planning as well. The SMNet used the collection of aggregated data from a variety of sources to develop these microplans (Independent Monitoring, SMNet mobilisation staff, and surveillance data from non-polio acute flaccid paralysis (AFP) cases) as a driving force in its planning and in the development and measurement of strategies and tracked these with standard indicators such as the examples from UNICEF in Figure 4. There is considerable evidence that where the SMNet was in place, coverage was higher, and groups of people not previously reached by health services were immunised. 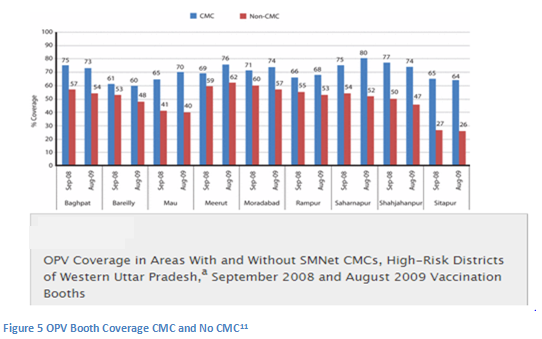 Figure 5 shows how booth coverage was significantly higher in areas with CMCs. The following Figure shows coverage for diphtheria, pertussis, and tetanus vaccine (DPT3) a generally accepted indicator for full immunisation coverage was also higher in areas where SMNet mobilisers were present. Perhaps the most telling indicator of how the role of SMNet has been interpreted within the Global Polio Eradication Initiative (GPEI) is that it has now become an essential reference for the design and implementation of large-scale polio social mobilisation programmes in Afghanistan, Pakistan, and Nigeria. The polio programme is complex and integrated (surveillance, procurement, research, large-scale campaign operations, mass media, and social mobilisation all work in a coordinated fashion) and it can be hard to point to the exact impact of any single element. However, it is clear that the SMNet made significant contributions to reducing missed children due to refusals, assisting vaccination teams to increase their coverage and improving levels of routine immunisation. Strategic use of data at every level, from planning and message development to results monitoring. Reviewing this history (which can be explored in much more depth via the many SMNet-focused items available on The CI's Polio theme site), the SMNet approach worked well because it was deeply embedded in and engaged with the communities it served. Its mobilisers were not outsiders. This community legitimacy was supported and linked to the larger state, federal and global elements of the PEI through a partnership of several organisations which brought different strengths to the table. UNICEF brought its focus on child health communication, a long history working on these issues with government in India, a central role in the PEI and experience managing large scale programmes. CGPP brought its own health communication expertise, experience working in partnerships (being itself a grouping of large international and local NGOs) and organizational flexibility to quickly develop and pilot innovative practise making it available for other partners to scale up. And, finally, the data collection forms, indicators, flipcharts, videos, localised posters, visual aids, and multi-media innovations developed by SMNet to support a wide range of polio and routine immunisation mobilisation efforts offer examples that can be brought to bear on other health issues to facilitate training, orientation, strategic thinking, and data collection and use. This commitment to evidence based programming, innovation, community engagement and rapid response was also practised internally through the ongoing professional development of SMNet staff. For instance, when a qualitative study showed that some CMCs and local health care providers had resisted vaccinating their own children and that local health care providers were counseling parents to avoid vaccinating children who showed signs of even the most minor illnesses, "SMNet partners revised messages and training curricula and adopted more frequent and interactive training approaches to prevent misinformation." SMNet demonstrated a commitment to continuing education and training for its staff, which, over time, built an increasingly professional cadre of social mobilisation practitioners. The future sustainability of SMNet as an important health resource for India has become a major topic of discussion. India is still threatened with polio importation from the remaining endemic countries and has to maintain high levels of polio immunization for many years to come. Yet it has now been polio free for over four years and the justification for SMNet based on the needs of the eradication effort are increasingly difficult to support. There is now a lot of discussion about the wider legacy of the PEI for health infrastructures. This is not uncontroversial. The GPEI has done research that indicates PEI’s impact on routine immunization ranges from neutral to positive but there are many who argue that the polio eradication effort's need to focus high levels of resources on a single antigen has impacted negatively on routine immunisation levels in many countries. SMNet stands as an important example of how such negative consequences can be ameliorated in future and why it is a resource that needs to be assessed for its potential to support other mother and child health priorities. For example, its approach of ensuring mobilisers and existing government health workers worked in an integrated fashion established a reinforcing role between SMNet's activities and other areas of mother and child health. Equally, SMNet's information, education, and communication (IEC) training and materials which went beyond a focus on polio to a range of other health issues have become part of the outreach and education practice of local health workers working in SMNet areas. In this way, support has been given to other health initiatives such as routine immunization, encouraging mothers to give birth in hospitals, tracking newborns, and helping to get services to underserved populations through community events. Health camps set up close to underserved communities continue to be used to provide a range of health services, including diagnosis by doctors, provision of medicines and antigens, and referrals to health centres. Through close cooperation with government health workers at all levels and the development and use of a range of materials that incorporate polio education with other maternal and child health messages on issues such as early breast feeding, ORT, diarrhoeal management, and use of zinc, sanitation, and nutrition the PEI was able to use SMNet in ways that strengthened permanent staff and material resources. As the future of SMNet is decided, discussions about how to incorporate the many successful innovations of SMNet into government community health systems are ongoing. We can only hope that such discussions lead to further cementing the lessons and experiences of SMNet into the fabric of India's health services. "From 200,000 to Zero: The Journey to a Polio Free India" [PDF]. (UNICEF, 2012), 13. These rumours of impotence were to some extent linked to India's history of forced sterilisation during 1975 and 1976. There is much written on the impact of the 1975 Emergency in India for a few reflections on the sterilisation programme and immunisation see: M. Nichter, "Vaccinations in the Third World: A Consideration of Community Demand," Social Science & Medicine, 41,(5), 617-32 and Fiza Salim, "Culture, Politics, and Religion: Exploring Resistance to Vaccinations in South Asia," Human Welfare, Volume 1, Issue 1, Spring 2012, 97. Jitendra Awale, "The CORE Group Polio Project, India Experience Sharing with Polio Program, Government of Afghanistan Kabul,' (Power Point Presentation used in Afghanistan, 2013), slide 20. Ellen A. Coates, Silvio Waisbord, Jitendra Awale, Roma Solomon, and Rina Dey, Successful Polio Eradication in Uttar Pradesh, India: The Pivotal Contribution of the Social Mobilization Network, an NGO/UNICEF Collaboration," Global Health: Science and Practice 2013, Volume 1, Number 1, 70. Polio Communications Quarterly Update UNICEF Report to the IMB (UNICEF, January 2012) [PDF], 17. Jitendra Awale, , The CORE Group Polio Project, India Experience Sharing with Polio Program, Government of Afghanistan Kabul, June 16 2013, slide 22. 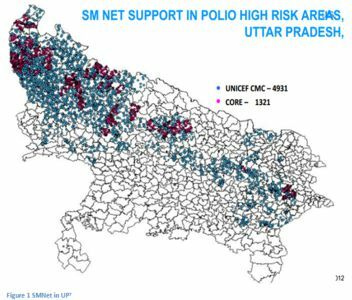 Ellen A. Coates, Silvio Waisbord, Jitendra Awale, Roma Solomon, and Rina Dey, "Successful Polio Eradication in Uttar Pradesh, India: The Pivotal Contribution of the Social Mobilization Network, an NGO/UNICEF Collaboration, [PDF]" 72. Jitendra Awale, "The CORE Group Polio Project, India Experience Sharing with Polio Program, Government of Afghanistan Kabul,, slide 30. "Polio Communications Quarterly Update UNICEF Report to the IMB" [PDF], 68. Ellen A. Coates, Silvio Waisbord, Jitendra Awale, Roma Solomon, and Rina Dey, "Successful Polio Eradication in Uttar Pradesh, India: The Pivotal Contribution of the Social Mobilization Network, an NGO/UNICEF Collaboration" [PDF], 80.